It’s difficult for me to choose one sempervivum as my favorite (except for Oddity, of course… that is always number one) because each one is special in its own way. However, Purdy’s 70-40 has to be near the top of the list. 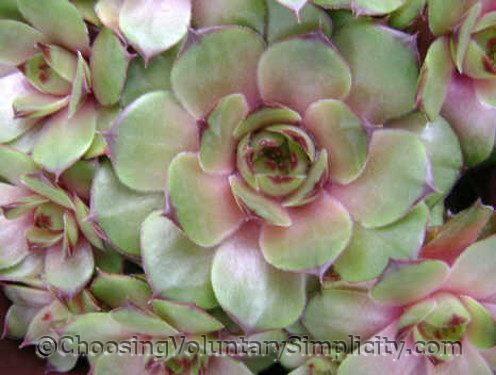 Purdy’s 70-40 is classified as a medium-sized sempervivum. I need to move most of mine this year… as you can see, they are growing so rapidly and producing so many chicks, their current growing spaces are becoming very crowded. Purdy’s 70-40 has many different looks. 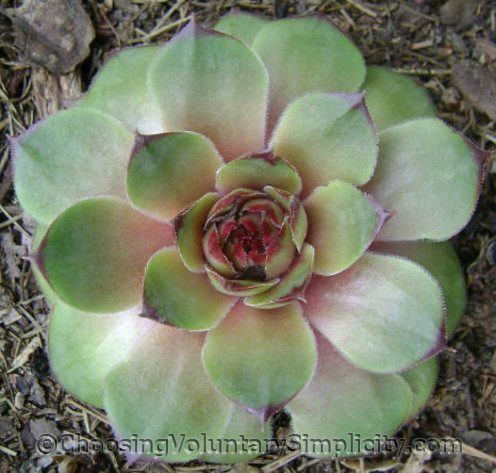 Like other sempervivums, it naturally goes through an incredible range of color changes during a growing season. Soil conditions, temperatures, and the amounts of available moisture and sunlight will also affect their coloration. As the temperatures drop in the fall, Purdy’s 70-40 starts to lose all of its bright color and becomes a mostly green and very ordinary looking sempervivum. The above photograph was taken in late October. By the time the snow has melted the next spring, the Purdys look a little winter weary, but after a couple of weeks of sunshine they are already starting to get a bit of color, first in the center of each rosette and near the base of each leaf. The rosettes also become more open as the season progresses. 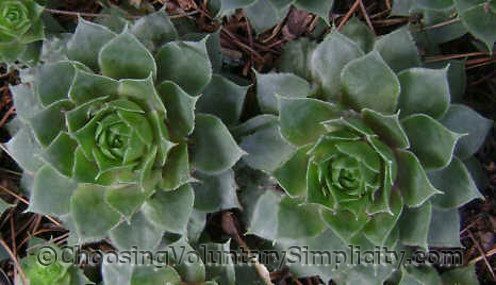 This photograph, of the same two sempervivums (above), was taken in late April. The color change is gradual but steady. The pink becomes more intensely pink and the green lightens. Some of the rosettes have a peachy tone… others are almost a maroon. In my gardens, the most beautiful coloration happens from mid-May to probably the end of August. How gorgeous is that!!! I did not know that hens-and-chicks were so attractive. I have some in a strawberry pot but I thought they were just green. I think I need to look at them more often. This is great information. Will you be posting about other types of semps too? Bruce, I hope to post about my other sempervivums, but it may be a slow process because I have so many photos to sort through and categorize for the different types. I love these sweet plants! I miss mine where we used to live. There was this huge outcropping of granite where nothing would grow so I tucked handfulls of dirt and sand in the crevices and got a few odd little plants that didn’t need much water. Soon the whole banking was covered in the most amazing variety of shapes and colors. In two years it looked like it had always been there. Wherever they could get a toehold, they did. I bought a bag of river rock and tucked it around the plants to help them find more crevices and places to grow. It was beautiful! When they were in bloom, they looked almost alien. Something from a desert. I took many pictures so I can go back and “visit” whenever I feel the need. Jo, we have “lizards” (actually spotted salamanders) in our garden too. I usually uncover them unintentionally, scream, and they slither away, but just this past weekend I managed to get some pretty good pictures of two of them. I like surprises in the garden too! Shirley — Beautiful variety! I’ve got a Purdy’s but not that exact cultivar. Will be interesting to see the differences. I got here from your “deer ate my semps” post. I just experienced this with some potted semps. Did you find that the deer focused on the larger varieties, and left the smaller ones alone? Or maybe ignored those with smaller lobes? Alan, the deer ate EVERYTHING. Our sempervivums were planted directly into garden beds, and the deer literally cleaned the beds. 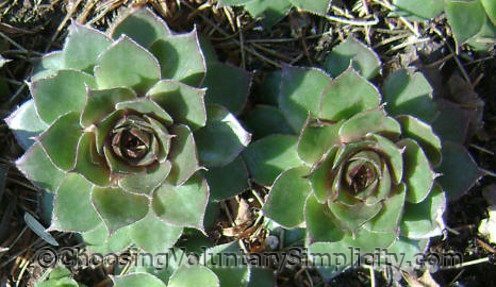 We did find that maybe six or eight small rosettes grew back from the stump of each original large rosette, so we actually ended up with more (but much smaller) rosettes than before the deer decimated the sempervivums. I wonder if their drastic “pruning” was the cause of the increase in number.